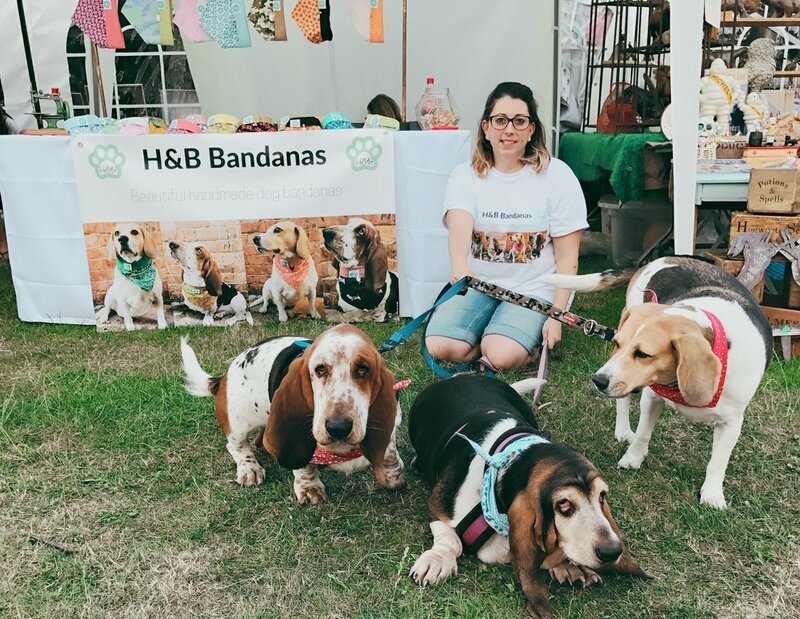 Up until now I had little opportunity to share my beautiful handmade dog bandanas. Exhibiting at Kew Fete was an exciting opportunity. I had so much fun preparing my stall and the feedback I got on the day was fantastic and so worth all the hard work! Having my three gorgeous hounds in with me made the day really special. We even entered Fred into the dog show! Mabel Syrup is our friends beautiful basset hound. Mabel was entered into our first Facebook competition in February and won! Mabel's mum Debbie Smith runs our local basset waddles (walk) and we are incredibly grateful for all her efforts including leading the waddle come rain or shine! Hugo and Bagel joined the waddles in November 2015 and we are now unable to walk them in any of the waddle locations without them expecting a troop of bassets on arrival! It turns out that Mabel is Hugo's half sister and it is lovely to see them playing together on the waddles ❤️ In fact Mabel plays with all the bassets and is a much loved friend to them all. Mabel recently passed her pet therapy exam (well done you clever girl!) and will soon be going to work helping those with special needs. I was delighted to be able to design Mabel her very own bandana and have chosen colours that I think reflect this special hound. Blue is the colour of the mind and is essentially soothing and a wonderful quality that Mabel has and will be great for her therapy role. Dona with her wonderful foster mum, Kelly. Beautiful 7 month old Dona was rescued from the streets of Romania as a puppy and brought to the UK through Romanian Rescue Appeal in search of her forever home. Romanian Rescue Appeal is a UK founded charity to help rescuers in Romania get dogs to a safe place urgently. Dona was fostered by Kelly Marshall who had her for two and half months and gave her the home comfort and love of a family. Dona's wish finally came true and she was adopted in February 2017. Kelly wanted a bandana for this beautiful girl who had been a lovely part of their lives for a short time. I jumped at the chance to make an extra special personalised present for Dona and of course her fantastic foster mum, who has given Dona the chance of a happy family life. The gorgeous Dona ready for her new home! I'm going to miss her so much, but I know if I didn't offer her a home she could possibly be still in Romania with no chance of a real life. It was so hard saying goodbye, but she's gone to a lovely home and I've seen a video of her charging around the garden with her new brother so that makes me feel very happy. She has her name engraved in a heart and Kirstin added some beautiful extra touches that brought tears to my eyes. Thank you again Kirstin "
Good luck beautiful Dona you deserve a wonderful life with your lovely new family, lots of love, H&B Bandanas. 'The Merlin' was designed for our friends dog, a gorgeous cockapoo. We, like our friends often struggle to leave our wonderful dogs for any length of time and an evening out can be shortened rushing back for the dogs. Our friends had the fabulous idea of inviting a group of friends round and including our Hugo and Bagel on the invite too. 'The Merlin' dog bandana was a thank you for such a thoughtful invite. What to know how the evening went? We had a fantastic night with fantastic friends, and enjoyed each others company until the early hours and it was awesome that Hugo and Bagel got to be party animals too! And of course they went dressed to impress in matching H&B dog bandanas. I have to say that having my dogs running around in someone else's home sent my anxiety levels through the roof! However, Hugo did me proud and my 18 month old basset that lets out a little wee when excited did not get a drop on my friends lovely cream carpet. And of course a beer or two worked wonders on my dog anxiety! Merlin was an amazing host to Hugo and Bagel and was just as excited as they were to have new friends to play with. Merlin even let Hugo and Bagel play with his massive stash of toys! We had such a great time and are already looking forward to returning the invite and having Merlin round to party with us! Hugo asking Harribo to play! Harribo is a handsome 3 year old Basset Hound. His mum asked me to make him a bandana for his 3rd birthday waddle (January 2017) so he could look super smart with all his basset friends. I love designing dog bandanas with a dog in mind, it makes the whole fun of bandana making so much more special and so I was super excited to get started. The bandana absolutely has to reflect Harribo's character. Harribo is very energetic, loves a rough and tumble playtime and there is no doubt that he is a boy! I have really loved watching Harribo and Hugo rough it up on the waddles. Of course I headed to my favourite local fabric shop Poppy Patch and found the perfect design for Harribo. It had to be blue as he as a proper boy! And the circles and colours really reflect that 'laddy' side to Harribo. 'The Harribo' was the first of our fresh new designs for 2017 and I was really excited to use our brand new woven labels and include the addition of a personalised tag. I love this design so much I made one for Hugo and Bagel too! Want to know what a waddle is? A group of basset hounds getting together to strut their waddling butts (a dog walk for basset hounds).